Mike, what do you wish you could tell your younger self? Wow. What a great question Amy has posed for me today. The first thing I thought was that the older you get, the more advice you have to offer. That would make me an expert. The second thing I thought was to simply say that almost everything my mother gave me for advice turned out to be accurate. So, listen to your mother, no matter how old you are. But I think what Amy really meant was what advice would I, as a writer, give to my younger self. That’s still a great question. Having written six books in the Sgt. Windflower Mystery series I have a lot of advice to give, at least to myself. Some of that advice would be to do some things completely different, but other things I would not just not change, I might do more of. To start with I wish I’d stayed in school and finished my university degree. But I was too impatient and wanted to see the world for myself, not have someone else tell me about it. So, I did. I found great jobs and careers and went everywhere from Australia to Africa to the Arctic Circle. But I could have gained even more from that experience if I had hung around school a few more years. Plus, I wouldn’t have to be researching all this history of Newfoundland that I do for my books. Because I would already know it. What I would do over again is to read a lot as a young person. I had three older sisters, two of them teachers, and they would drag me along with them to the library. There I discovered the magic and mystery of books and the fact that I could escape into other worlds any time I wanted. Stephen King once said that the best way to be a good writer is to be a great reader. I agree. But I think that looking back I wish that I had been brave enough to become a full-time writer as soon as possible. That is the way to really grow as a writer. I have been writing, part-time and as part of many of the jobs in my career, but I only allowed myself the privilege of becoming a mostly full-time writer in the last dozen years or so. Part of it was the fact that I had become kind of used to eating and living reasonably well, and could not see how to continue that if I gave up my other work. But when I finally bit the bullet and declared myself a writer, things started to get better, and more paid writing assignments started to show up. That was a few years ago now since I made that decision, and I’m very happy I did. I don’t make nearly enough from fiction writing to pay the bills. But my freelance writing and other paid projects keep me going. More importantly, I am happier than I ever have been in my life. When I think back on it, that was all my mother was trying to help me achieve. The Walker on the Cape was his first full fiction book and the premiere of the Sgt. Windflower Mystery Series. Other books in the series include The Body on the T, Beneath the Surface, A Twist of Fortune, and A Long Ways from Home. 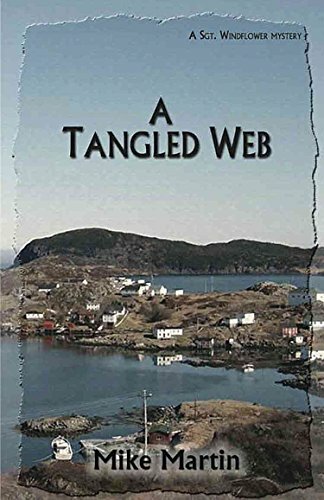 Mike has generously offered to give one ebook copy of A Tangled Web to one lucky reader. A winner will be chosen randomly from comments left below through December 7.